Quick Fixes - Henderson, NV | Dr. Minoli John J. Minoli M.D., F.A.C.S. Our skin gives texture to our underlying form: But skin is not static – it is dynamic and full of expression. 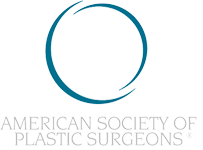 While surgical skin re-draping (i.e., face-neck lifting) remains a gold standard, nowadays office-based procedures are used for initial enhancement. Injectable products such as Botox, Belotero, Dysport, Juvéderm, Radiesse, Restylane, Restylane-Lift, Restylane-Silk, Sculptra & Voluma are usually administered in our clinics to produce varying degrees of restoration … so much so that the combination of injections has come to be known as a liquid facelift. (Commonly-used injectable materials include a variety of substances which have different forms of action. Each of these materials is injected into the face & neck to soften wrinkles, restore shape and/or add volume.) In addition, chemical peels can enhance the office-based experience even further. For over 2 decades Dr. John Minoli has helped many patients choose between cosmetic surgery and office-based non-surgical procedures. Why? Because: He has been doing both for years. Dr. John Minoli offers you years of trusted experience … and a range of non-surgical, office-based procedures for beautifying and even re-sculpting your face & neck. He is multi-board-certified in aesthetic surgery and for decades has treated thousands of patients, not only in Las Vegas but also in several other regions of the United States. While Dr. Minoli currently maintains his primary office and surgical settings in Las Vegas valley, he also consults & performs office-based treatments for patients on the Upper East Side of Manhattan in the heart of New York City. As modern medicine offers safer non-surgical methods for rejuvenating the face & neck, Dr. Minoli continues to adapt his practice accordingly through extensive continued surgical education and experience. Dr. Minoli and his staff routinely treat patients of all different ages, tailoring non-surgical treatments according to a person’s individual needs. A personal consultation with Dr. Minoli may help you further appreciate these highly individualized issues. 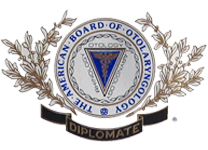 (Of course, Dr. Minoli also maintains an active practice dealing with actual surgery of the nose & face too. His is not just a non-surgical practice. Appropriate prescription medications are provided for pre-therapy & post-therapy use as needed (e.g., antibiotics, muscle relaxants, pain killers & topical skin preparations). Of course if clinically indicated, whatever treatment is selected to enhance the appearance of your face and/or neck, various medications may be used to comfort you during and after these treatments. Today, less invasive techniques performed in office-settings provide millions of people with safe, quick choices for looking refreshed & feeling restored. “Worry wrinkles,” “angry furrows” and “laugh lines” around the eyes & brow can be exquisitely softened with biocompatible neuromodulators such as BOTOX® & DYSPORT during in-office injections which produce little-to-no down time. As with all treatments, Dr. Minoli prefers to use only the safest, tried-and-true injectable treatments. 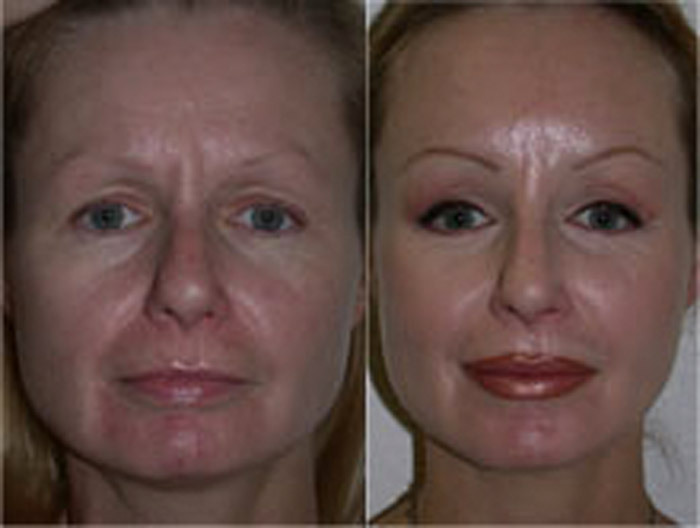 Are you a good candidate for upper facial enhancement via BOTOX or DYSPORT injections? If you have expression-furrows along your brow or wrinkles around the corners of your eyes, you are a candidate for BOTOX and DYSPORT injections to soften this lined or craggy appearance. If your brow position is somewhat irregular you may be a candidate for BOTOX or DYSPORT injections to even this imbalance in eyebrow orientation. How is upper facial enhancement via BOTOX or DYSPORT injections performed...And what is the after-care like? Basically, BOTOX & DYSPORT treatments involve the injection of safe, biocompatible chemicals which derive from nature. The chosen material is injected through concealed entry points. The injection of biologically compatible substances such as BOTOX & DYSPORT can be done in an office-setting – with your return to normal activities likely being the following day. Repetitive gentle cool washings of the face will help in the early stages after injections. And ice can be of help, though it is not mandatory. Of course, sometimes bruising can occur (and occasionally even last a while), but this is uncommon and eventually subsides. 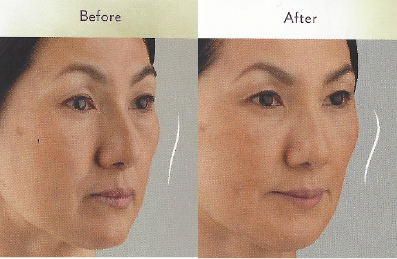 What are some key features of upper facial enhancement via BOTOX or DYSPORT injections? In my opinion, upper facial enhancement via BOTOX or DYSPORT injections should be thought of in a broad context – rejuvenation around the entire brow-eyelid region, not just specific parts…and rejuvenation in relation to the surrounding face. Certainly, the specific parts will be enhanced; but so too will the adjacent areas. A pretty or handsome upper face has as much do with the eyebrow-eyelid relationship to surrounding facial structures as it has to do with the eyebrow or the eyelids themselves. Dr. Minoli can help guide you in understanding these aspects of your decision-making. A sagging, deflated mid-face can be exquisitely restored to one with full & rosy cheeks through the use of biocompatible fillers such as RESTYLANE-LYFT & VOLUMA during in-office injections which produce little-to-no down time. As with all treatments, Dr. Minoli prefers to use only the safest, tried-and-true injectable treatments. 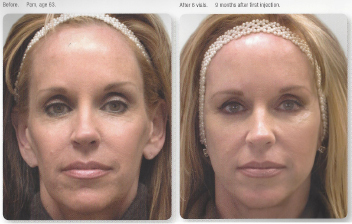 Are you a good candidate for mid-facial enhancement via filler injections? Men and women who have experienced a progressive sagging and deflation of their cheeks and nasolabial folds (furrows at junction of cheek & upper lip) are candidates for filler injections, especially thick fillers such as VOLUMA & RESTYLANE-LYFT. These quick office-based procedures can often add a much more youthful attitude to the face. How is mid-facial enhancement via filler injections performed...And what is the after-care like? 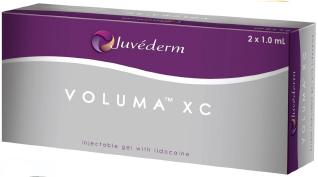 Basically, mid-facial enhancement with VOLUMA & RESTYLANE-LYFT involves the injection of safe, biocompatible volumizing-substances which derive from nature. The chosen material is injected through concealed entry points. The injection of biologically compatible substances such as VOLUMA & RESTYLANE-LYFT can be done in an office-setting – with your return to normal activities likely being the following day. Repetitive gentle cool washings of the face will help in the early stages after injections. And ice can be of help, though it is not mandatory. Of course, sometimes bruising can occur (and occasionally even last a while), but this is uncommon and eventually subsides. What are some key features of mid-facial enhancement via filler injections? In my opinion, upper facial enhancement via VOLUMA & RESTYLANE-LYFT injections should be thought of in a broad context – rejuvenation around the entire mid-face and not just specific regions of the cheek or nasolabial folds … and rejuvenation in relation to the surrounding face as a whole. Certainly, the specific parts will be enhanced; but so too will the adjacent areas. A pretty or handsome upper face has as much do with the mid-facial relationship to other surrounding facial structures as it has to do with the cheeks themselves. 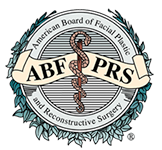 PLEASE NOTE: Some patients may benefit from a somewhat more involved procedure, such as having their own fat injected into their mid-face (i.e., autologous fat grafting [self-donor fat – with stem cell potential] – the use of one’s own fat which can be transferred from the body to the face). 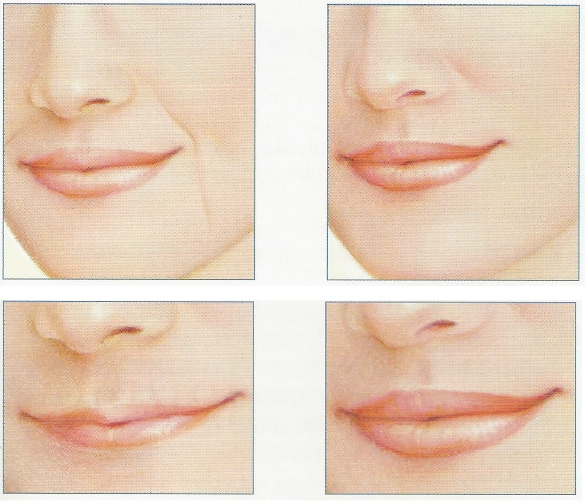 Thin and/or aging lips can be exquisitely augmented with natural or biocompatible material. Dr. John Minoli uses such biocompatible injectables such as Belotero, Collagen, Juvéderm & Restylane-Silk during in-office lip augmentation which produces little-to-no down time. For years Dr. Minoli has also surgically-implanted natural biologic sheeting (i.e., Alloderm) and also injected patients’ own body fat to augment their lips. Although other injectable materials not listed here ARE on the market for lip augmentation, Dr. Minoli prefers to use only the safest, tried-and-true treatments. Are you a good candidate for lower facial enhancement with lip augmentation and/or perioral restoration? Most patients who are experiencing signs of aging often have changes around the mouth – with real tell-tale signs including thinning of the lips and deepening of natural surrounding creases. You may have lost some substance of your lips over the years … or perhaps to begin with you never had lips quite as full as you would have liked. These are all decent reasons to have lip augmentation, and the results can often add a much more youthful attitude to the face. How is lower facial enhancement with lip augmentation and/or perioral restoration performed...What is after-care like? Basically, lip augmentation involves the injection of some safe material (either a biologically-compatible substance [e.g., Collagen, Juvéderm, Restylane or Alloderm]; or one’s own fat). The selected material is injected through concealed entry points (usually at the mouth’s corners). The injection of biologically compatible substances such as Collagen, Juvéderm of Restylane can be done in an office-setting – with return to normal activities likely the following day. Repetitive gentle cool washings of the face will help in the early stages after injections. And ice can be of help, though it is not mandatory. Of course, sometimes notable bruising can occur (and occasionally even last a while), but this is uncommon and eventually subsides. The injection of one’s own fat, while a relatively straightforward procedure, is usually performed in a mini-surgical setting and is a more involved process than the commercially-available in-office injections just described. What are some key features of lower facial enhancement with lip augmentation and/or perioral restoration? Firstly, in my opinion lip augmentation should be thought of in a broad context – rejuvenation around the entire mouth. A pretty or handsome lower face is not so just because of aesthetic lips, though the finessing of the inherent lip shape is highly important. A pretty or handsome lower face has just as much do with the lips’ relationship to surrounding perioral structures such as the chin, the skin under the nose, and the adjacent laugh lines. Dr. Minoli can help guide you in understanding this part of your decision-making. Some patients simply need office-based lip injections of commercially-available biologic fillers, such as Juvéderm® or Restylane. Others may benefit from a somewhat more involved procedure, such as having their own fat injected into their lips (i.e., autologous fat grafting [self-donor fat – with stem cell potential] – the use of one’s own fat which can be transferred from the body to the face). Others may require surgical procedures which actually shorten the length of the upper lip thereby creating more of a pouty-lip appearance. Surgical incisions for such a procedure are carefully placed along the deep nasal sill crease at the very bottom of the nasal base, hidden. Others still may require a surgical advancement of their vermillion ridges. Surgical incisions for such a procedure are carefully & crisply placed at the vermillion edges of the lip margins. Sallow, wrinkled, sun-damaged skin can be exquisitely restored through the topical application & treatment of skin with various chemicals (e.g., light acidic solutions), some of which have been used aesthetically for thousands of years. Depending on the degree of chemical peeling there may be some, little or no down-time. Dr. Minoli prefers to use only the safest, tried-and-true chemical peels. Are you a good candidate for chemic al peeling? If you have aging, sun-damaged skin you are a candidate for chemical peeling to soften this lined or craggy appearance. Many types of chemical peels are quick office-based procedures which can often add a much more youthful attitude to the face. Peels diminish wrinkles and lighten pigmented spots by removing the skin’s top layers while preserving deeper layers which replenish fresh skin. Chemical peels have proven to be a very popular nonsurgical cosmetic procedure – even a potential alternative to laser therapy. 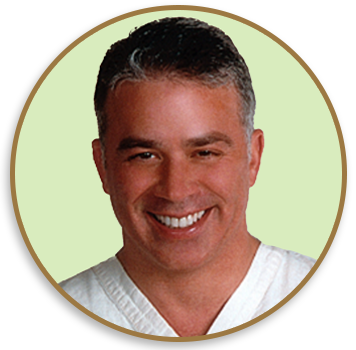 Dr. Minoli & his staff can help guide you toward the peels that are right for you. How is chemical peeling performed...And what is the after-care like? Basically, chemical peel treatments involve the application of acidic solutions to aging, sun-damaged skin. Peels diminish wrinkles and lighten pigmented spots by removing the skin’s top layers while preserving deeper layers which replenish fresh skin. Chemical peels vary according to their specific ingredients, strengths, application times, and vigor of penetration. Chemical peels are actually based on the application of different types of acidic solutions to aging, sun-damaged skin. Some peels can be done in an office-setting with little-or-no downtime, but other peels require private healing time for several days. Peels diminish wrinkles and lighten pigmented spots by removing the skin’s top layers while preserving deeper layers which replenish fresh skin. Repetitive gentle cool washings of the face will help in the early stages after peels: And topical applications of petroleum-based agents such as Aquaphor or Vaseline applied at home several times a day during the first few days after chemical peeling. What are some key features of chemical peeling? Chemical peels involve the application of acidic solutions to aging, sun-damaged skin. Peels diminish wrinkles and lighten pigmented spots by removing the skin’s top layers while preserving deeper layers which replenish fresh skin. Chemical peels have proven to be a very popular nonsurgical cosmetic procedure – even a potential alternative to laser therapy. Peels vary according to their specific ingredients, strengths, application times, and vigor of penetration. Dr. John Minoli and his staff can help guide you toward the peels that are right for you. Typically, a chemical peeling solution is applied with a gauze sponge, cotton pad, cotton swab or brush. Alpha-hydroxy acids (α-hydroxy acids or AHAs) are usually the most superficial of chemical peels – and include glycolic acid, lactic acid and fruit acid. Various concentrations of alpha-hydroxy acids may be applied weekly (or at longer intervals) for best results. Trichloroacetic acid (TCA) peel is stronger, and has a greater depth of penetration than light alpha-hydroxy acid peels. Phenol peels usually represent the strongest of chemical peels, providing relatively deep levels of skin penetration (similar to skin-penetration levels achieved with certain ablative lasers). And of course specific compounds of chemical peeling ingredients are used in certain, popular treatments such as the VI Peel™. Botulinum toxin injections (referred to by such product names as Botox®, Dysport® & Xeomin®) are biological toxins (botulinum toxins) transformed into therapeutic agents known as neuromodulators. Clinicians began working with Botox in the late 1960s for treatment of certain neurological disorders. Today, Botox is used for a variety of cosmetic and neurological conditions. Botox is used for treatment of frown lines, forehead furrows, crow’s feet, lower facial wrinkles, nasal muscles which produce bunny-line wrinkles, and even neck muscles. In fact, Botox injections have proven to be one of the most popular of all cosmetic procedures. The type of lines and wrinkles that respond to Botox injections are those caused by muscles – specifically those muscles that contract during certain facial expressions such as frowning or squinting or raising one’s forehead in surprise. During Botox injections patients are asked to contract muscles within a given treatment area. This aids Dr. Minoli in identifying the proper injection sites. In most cases, Botox injections penetrate directly into a given muscle through a tiny needle. The effect of Botox injections is not immediate, but usually takes several days to work. For patient comfort, a topical ice is usually applied prior to Botox injections so as to reduce needle discomfort. After several decades of clinical use, Botox injections have proven to be safe. No systemic complications associated with Botox injections have been documented to date. There is no downtime. Patients can immediately resume normal activities. The treatment is reversible within several months. Botox injections are beneficial for a variety of conditions other than cosmetic (e.g., migraine headaches & excessive sweating). Botox injections are a temporary solution for the treatment of wrinkles. The effect lasts from 4-6 months. Repeat treatments are required to maintain the effect. Possible side effects include local numbness, swelling, bruising, or a burning sensation during injection. Some patients have reported temporary headaches and nausea. Most side effects are of short duration. A small percentage of patients who receive Botox injections are reported to experience no improvement at all. Patients with early signs of aging, as well as those who may not be suitable candidates for more extensive facial aesthetic surgery, may still be good candidates for Botox injections. Certain medications (some antibiotics, anti-inflammatories, or aspirin) and even some vitamins and herbs, may increase the potency of Botox and may increase bleeding and bruising at the time of injections. A candid discussion with Dr. Minoli and his staff about all medications and supplements is usually quite helpful in the planning of a treatment. 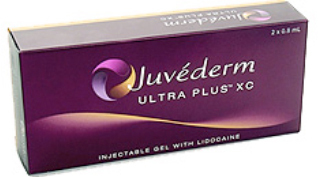 Hyaluronic acid is a natural polysaccharide and a versatile soft-tissue filler. 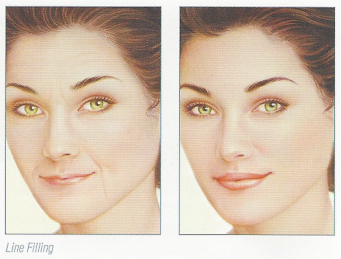 It is being used widely for the management of wrinkles; fine lines; contour deformities; and volumetric deficiencies of the face, cheeks, and lips – all of which can be associated with aging, developmental anomalies, and certain individual diseases which can effect soft tissues of the body. Hyaluronic acid is not the final answer as an ideal soft-tissue filler, but it clearly provides a safe, predictable, and user-friendly material. Hyaluronic acid filler injections are typically performed in an office setting. For patient comfort, topical ice is usually applied prior to treatment in order to reduce needle discomfort. Of course, a nerve block may be preferable for some patients. Hyaluronic acid is a hydrophilic agent, which means that it attracts water much like a sponge. This expansion contributes to the final fill-volume that is attained. Therefore, under-filling is often necessary, and patients may well benefit from a touch-up session several weeks after initial treatment. Over-filling can produce bumps and irregularities which, although rare, create a small, temporary cosmetic problem. Overall results can last more than 6 months in patients. 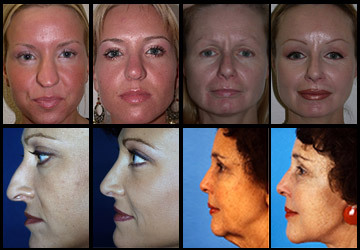 The injections are especially effective for the nasolabial folds, lips, and other areas of facial-contour deformities. Hyaluronic acid injections are also an ideal adjunct to Botox treatments and are frequently combined with Botox during a given session in order to correct persistent lines and creases more thoroughly. Hyaluronic acid is a natural substance that does not require allergic pre-testing. Patients can immediately apply makeup and return to normal activities. Injections can last for approximately six months. Bruising and swelling may occur for a number of days. Small bumps are infrequently visible or palpable (but these can be treated with antidote injections of hyaluronidase if irregularities persist). After several weeks, repeat injections may be needed to achieve ideal results. Sculptra (poly-L-lactic acid) injections have been used for almost 2 decades to improve the aging appearance of the face – particularly around the site of skin folds, indented chin surfaces, hollowed cheeks, and sunken eyes. Sculptra was first introduced to the United States for treatment of patients with facial wasting (e.g., immunocompromised patients undergoing treatment). In more recent years the FDA has approved the use of Sculptra for treatment of deep nasolabial smile folds and other facial wrinkles. 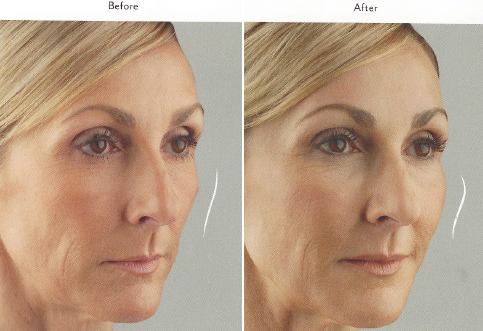 The Sculptra filler provides up to 80% improvement in the treated areas. It produces noticeable results after a few treatment sessions and usually lasts up to 2 years (in some cases even longer). The Sculptra procedure is performed in Dr. Minoli’s office in an outpatient setting, typically for patients between the ages of 35 & 65. It is performed in combination with a local anesthetic and topical application of ice so that typically there is minimal discomfort from the needle injections. A treatment can last 15 to 30 minutes, depending on the extent of treatment. 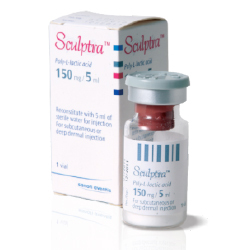 Sculptra is a synthetic poly-L-lactic acid injectable material. The material has been commonly used in dissolvable stitches and soft tissue implants. (Actually, a natural form of poly-L-lactic acid is even produced in our muscles during exercise.) The material, which is biocompatible and can be dissolved by the body, works to gradually produce increasing thickness of the skin. Sculptra (poly-L-lactic acid) is a substance that does not require allergic pre-testing. There is no downtime. Patients can immediately resume normal activities; however they are advised to stay out of the sun in the early stages. There are very few side effects. 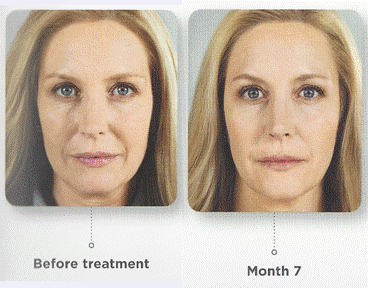 (Touchup treatments may be required at 6 to 8 week intervals until optimal results are achieved). Injections can last for over 2 years. Small bumps are infrequently visible or palpable, but these can be treated typically with a massage regimen if irregularities persist. Results gradually become evident over the course of several weeks. In the final analysis, since results from Sculptra injections are, temporary (two years or more), treatments have to be repeated in future years to maintain the accrued benefits. KYBELLA® is an injectable treatment for adults with a double chin that permanently destroys fat cells when injected under the chin for an improved profile. KYBELLA® (deoxycholic acid) injection is indicated for improvement in the appearance of moderate to severe convexity or fullness associated with submental fat in adults. The safe and effective use of KYBELLA® for the treatment of subcutaneous fat outside the submental region has not been established and is not recommended. KYBELLA® (deoxycholic acid) is a non-human and non-animal formulation of deoxycholic acid, a naturally-occurring molecule in the body that aids in the breakdown and absorption of dietary fat. When injected into subcutaneous fat, KYBELLA® (deoxycholic acid) destroys fat cells: And once those fat cells are destroyed, they can no longer store or accumulate fate. After the aesthetic response is achieved, re-treatment with KYBELLA® (deoxycholic acid) is not expected. Due to its cytolytic activity, KYBELLA® (deoxycholic acid) should not be injected into or in close proximity to vulnerable anatomic structures. WHAT ARE THE INDICATIONS FOR USING KYBELLA®? KYBELLA® is used to treat SUBMENTAL FULLNESS. If you are interested in a nonsurgical way to reduce fullness beneath your chin, KYBELLA® may be right for you. KYBELLA® is a first-of-its-kind injectable treatment for adults with submental fullness that destroys fat cells under the chin to improve your profile. You feel the condition of submental fullness makes you look older or heavier than you actually are. You eat well and exercise, but submental fullness doesn’t go away. WHAT IS THE APPROVED USE & IMPORTANT SAFETY INFORMATION ABOUT KYBLELLA®? It is not known if KYBELLA® is safe and effective for use outside of the submental area … or in children less than 18 years of age. Tell your health care provider about all the medicines you take – including prescription and over-the-counter medicines, vitamins, and herbal supplements. Especially tell your health care provider if you take a medicine that prevents the clotting of your blood (anti-platelet or anti-coagulant medicine). KYBELLA® can cause serious side effects – including nerve injury in the jaw which can cause an uneven smile or facial muscle weakness or trouble swallowing. The most common side effects of KYBELLA® include swelling, bruising, pain, numbness, redness, and areas of hardness in the treatment area. These are not all of the possible side effects of KYBELLA®. Call your health care provider for medical advice about side effects. Please see full prescribing information on www.myKYBELLA.com. KYBELLA® (deoxycholic acid) is administered by injections into the fat under the chin. Treatment with KYBELLA® (deoxycholic acid) is customized by the physician to the patient’s goals for an improved chin profile. WHAT ARE THE RESULTS OF KYBELLA® CLINICAL TRIALS? In the pooled, pivotal Phase III studies, 68.2% of patients responded to KYBELLA® (deoxycholic acid) based on a composite of validated physician and patient measurements. Many patients experienced visible results in 2 to 4 treatments. 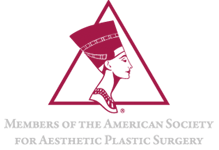 KYBELLA® (deoxycholic acid) injectable treatment resulted in high patient satisfaction. In clinical studies, 28%, 43% and 55% of KYBELLA-treated patients had a >1 grad composite improvement after 2, 3 and 4 treatments, respectively. KYBELLA® (deoxycholic acid) has been the focus of a global clinical development program involving over 20 clinical studies with more than 2,600 patients worldwide, of which over 1,600 have been treated with KYBELLA®. Production of KYBELLA® (deoxycholic acid) is a highly controlled, quality-assured and validated current Good-Manufacturing-Practices-Compliant process to ensure patient safety. KYBELLA® contains no human or animal-derived substances. WHAT ARE THE SIDE EFFECTES WITH KYBELLA®? 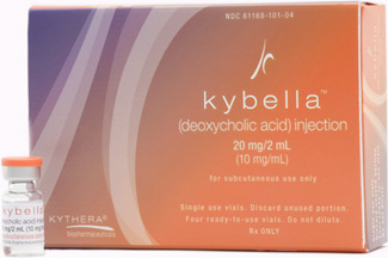 The safety profile of KYBELLA® (deoxycholic acid) is well characterized. Side effects may include swelling, bruising, pain, numbness, redness or formation of small areas of firmness. Adverse events with KYBELLA® (deoxycholic acid) infrequently resulted in discontinuation from the study (1.6% of participants). Care must be taken when injecting KYBELLA® (deoxycholic acid) to avoid the risk of marginal mandibular nerve injury and dysphagia. Alpha-hydroxy acids are a class of weak acids which penetrate human skin when topically applied during clinical rejuvenation treatments. Ultimately, they refresh and smooth the skin by causing exfoliation (shedding of skin), collagen synthesis, and a slight vital thickening of the skin itself. The alpha-hydroxy acids are often naturally-occurring fermentation products of certain foods and fruits – citric acid (from citrus fruits), glycolic acid (from sugar), lactic acid (from sour milk), malic acid (from apples), mandelic acid (from almond extract), and tartaric acid (from grape wine). At lower concentrations these acids are found in many over-the-counter skin care products; and in higher concentrations they are used for clinical treatments. Alpha-hydroxy acid chemical peeling is a short, safe procedure in which no anesthesia or sedation is needed. The solution produces only a mild tingling or stinging sensation when topically applied. Sometimes a single treatment will convey a healthier, more radiant look to the skin. The procedure causes no downtime, and no covering or after-peel ointment is needed. Normal activities may be resumed immediately. Sun block is strongly recommended: Skin may not tan evenly following a chemical peel. The alpha-hydroxy acid chemical peeling process may involve multiple treatments. Mild concentrations of alpha-hydroxy acids can be mixed with facial creams or body washes as part of a daily skin-care regimen. TCA peels are used as an intermediate to deep peeling agent in concentrations usually ranging from 15-50%. The depth of skin penetration increases as the TCA peel concentration increases – with 50% TCA penetrating deeply into the skin. (In fact, concentrations higher than 35% are not recommended because of the higher risk of scarring.) 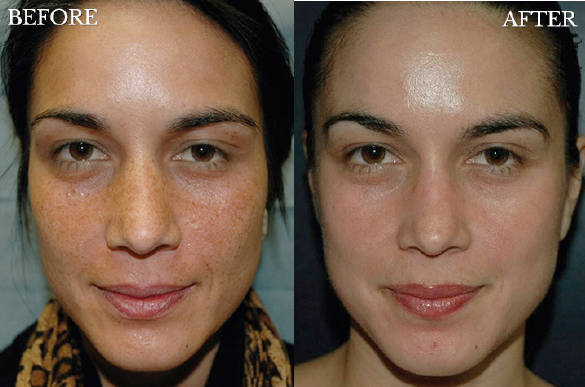 TCA peels, as opposed to phenol peels, are preferred for darker-skinned patients. TCA is especially effective in treating darker-skinned patients; and is typically a short, safe procedure. TCA peeling generally produces a shorter recovery time than a deep phenol peel. TCA peeling may require pre-treatment with alpha-hydroxy acid products or Retin-A (Vitamin A derivative) creams. Repeat treatments may be helpful. TCA peeling may cause changes which require several days of healing, depending on depth of skin penetration. Deeper TCA peels may result in 3 or more days of restricted activity. Sun block is strongly recommended, especially after TCA treatment. 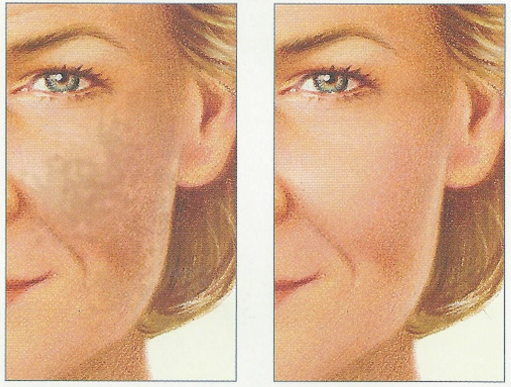 Skin pores may appear larger, and the skin many not tan evenly following a chemical peel. Some facial skin disorders to not respond to chemical peeling. A deep chemical skin peel, or phenol peel, is the strongest of chemical peels, and is reserved for individuals with deep wrinkles from sun exposure or deep dynamic wrinkles around the lips and chin. The procedure diminishes imperfections in sun-damaged, unevenly pigmented, coarsely wrinkled facial areas by peeling away the skin’s top layers. A full-face deep chemical peel takes 1-2 hours to perform and is done in a monitored setting. A more limited procedure (such as treatment of a wrinkled upper lip) will generally take less than 30 minutes. A solution is applied to a given treatment area (with much care around the eyes and lips). There is a slight burning sensation, but it is minimal since the solution also acts as an anesthetic. After the peel solution has worked on the skin, it is neutralized with water. Within an hour of treatment, a thick coating of petroleum jelly is layered over the face, covering the protective crust which develops rapidly over the area. This jelly stays in place for 1-2 days. Some patients experience discomfort after a deep chemical peel, but this can be controlled with medication. A few days after the procedure, the protective crust flakes off and new skin with a bright pink color (akin to sunburn) will emerge; the pinkness will fade within a few weeks. Post-operative puffiness will subside in a few days, but the skin will remain sensitive. 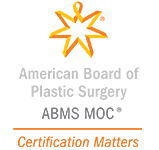 Patients should avoid exposure to sunlight and continue to use sun block. The effects of phenol chemical peel are long lasting, and in some cases are still readily apparent up to 20 years following the procedure. Improvement in the patient’s skin can be quite dramatic. A normal work schedule and other activities can be resumed after 1-2 weeks. Possible postoperative complications can include scarring, infection abnormal pigmentation or bleaching. Patients may need to wear make-up to match treated and untreated areas. EKG monitoring is advised during the procedure. Phenol peels cannot be used on the neck or other parts of the body. Phenol peels are not as effective in treating individuals with dark, oily complexions. Although the fat injection technique (autologous fat transplantation) is technically a minor surgical procedure, it provides an excellent source of soft-tissue filler material which, to some degree, has a permanent effect. Although the procedure is often done in an operating room as an adjunct to other surgical procedures, it is also quite possible to have such injections done under local anesthesia in an office setting. Fat injections transfer fat from one part of the body to another – in many cases, helping re-contour the face; diminishing frown lines, crow’s feet & nasolabial folds (smile lines); providing definition to areas such as the cheeks and chin; and even filling out depressed bodily scars. While some fat particles permanently survive the transfer, others do not – so, repeat treatments may be warranted for ideal long-lasting results. The fat injection technique can be described as follows. The donor site (for example, the abdominal wall, buttocks, or thighs) and the recipient site are injected with local anesthetic. Intravenous fluids may also be injected into the donor site to facilitate fat collection. Fat is extracted through a specialized needle and processed for the removal of excess fluids. It is then re-injected in multiple thin strands within a desired recipient area (e.g., specific areas along the face & lips). Mild over-filling may be necessary in order to counter the natural effects of partial fat absorption during the weeks that follow treatment. Fat also can be harvested during liposuction within one area of the body, then re-injected into another desired area. The longest-lasting effects usually involve repeat treatments. Fat injections are natural and non-allergenic. Fat injections can be performed as an outpatient procedure. Fat injections cause little down time. Fat injections cause minimal discomfort which usually can be controlled with oral medication. Fat injections – in part – last permanently. Fat injections are cost effective if combined with other procedures. There is some swelling and bruising after the injections – mostly within the first 3 days. Patients should avoid sun during the early stages of healing. The longevity of results can vary from patient to patient.